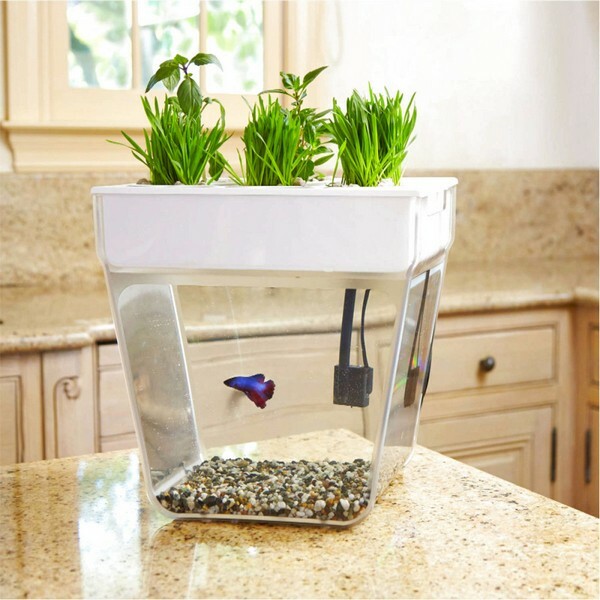 A stylish fish tank which grows herbs and sprouts – is it possible? Yes! And this marvel is called an aquafarm. 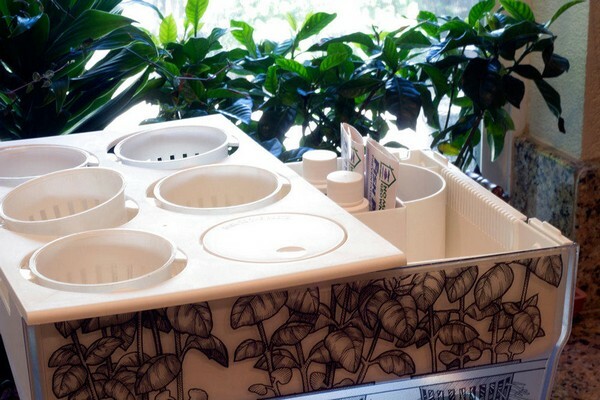 This device is amazing at first glance: it seems like a common fish tank, but for some reason it’s covered with pots with real herbs. This makes you think: “Won’t the fish suffocate and die? How and what do the plants feed on? Where do fish waste products disappear?” We’ll explain right now! An aquafarm is a real small hydroponic ecosystem which is composed of a fish and plants. Special bacteria help to transform nitrogen produced by a fish into the new form, which is available for plants. Thus, plants get the necessary nutrition, fish gets clean water, and you get a pet, fresh air and healthy herb to boot. 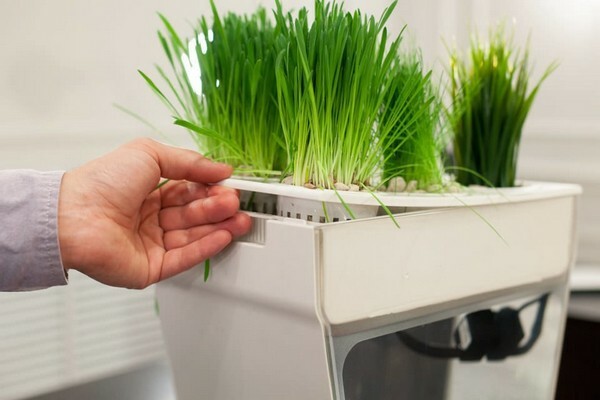 Which is more important, this super home mini-farm doesn’t demand much effort to create and maintain. The set already includes a fish tank, pots, seeds and fish food. You just go to the pet store and buy a fish. Following the instructions you will install the system within about 20 minutes, plug it in and enjoy the result! All you need is to feed the fish from time to time. The system is totally self-cleaning and includes a special pump, which operates without your action. Once we have found out what an aquafarm is, let’s move on to details. What plants can be grown in an aquafarm? Firstly, it’s better to grow herbs rather than indoor flowers. The thing is that flowers need far more nutrients than an aquafarm may produce. Hence the best choice is wheat, basil, arugula, parsley, mint, dill and coriander. By the way, wheat seeds will grow into a true mini-green lawn in just 3-4 days! What fish are suitable for aquafarm systems? It’s vital to understand that not every specimen will survive in this ecosystem. The inhabitant of such a fish tank must be resistant to fluctuations in nitrites and ammonia rates. The authors of the aquafarm recommend choosing Siamese fighting fish, or the Betta. It’s better for the Betta to live alone as it sometimes acts aggressively towards neighbors. One more option is zebra danio, or zebrafish. They can live in groups of two or three. Since the volume of the tank is just 11 liters, you’d better not put more than 3 fish in it. Where can an aquafarm be used? The aquafarm was born thanks to cooperative efforts of hydroponics specialists, biologists, engineers and, of course, designers. And the fruit of their job turned out to be very sweet and stylish at the same time. And taking that we so much lack nature in our lives, especially in big cities, and the aquafarm doesn’t require much effort to maintain, it will be a nice choice both for our homes, offices, schools and kindergartens.